Calculator for the achievable power of a solar thermal system on a certain area. Solar thermal means the conversion of solar energy into usable heat, e.g. for tap water (in bathroom and kitchen), or for heating. The thermal output of a system can be calculated in watts. For irradiance, 1000 is a good estimation for Central Europe, exact values can be taken from local solar maps. The efficiency factor of solar thermal systems is higher as for photovoltaic systems. Power per area is calculated from irradiance and efficiency factor. Please enter either this value or to two former values. Also, enter the area or nominal thermal power. The remaining value will be calculated. Example: at an irradiance of 1050 watts per square meter and a system size of 8.5 square meters, the nominal thermal power is almost 6 kilowatts. 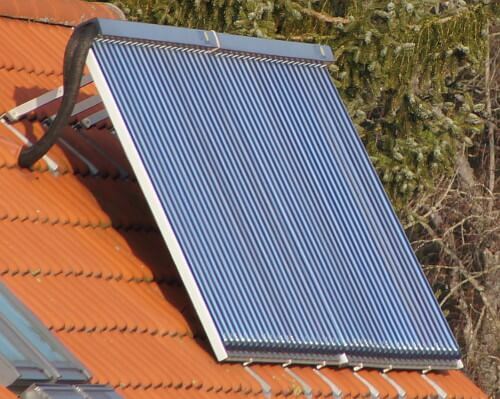 Solar thermal collectors on a roof.